This nice and neatly kept apartment is on a large estate. In total there are 4 apartments divided over 2 buildings. You and the other residents have access to a spacious garden with large pool, a number of terraces and several playing facilities for the kids. The estate lies in lush green, hilly surroundings. In the middle of the magnificent Chianti region. 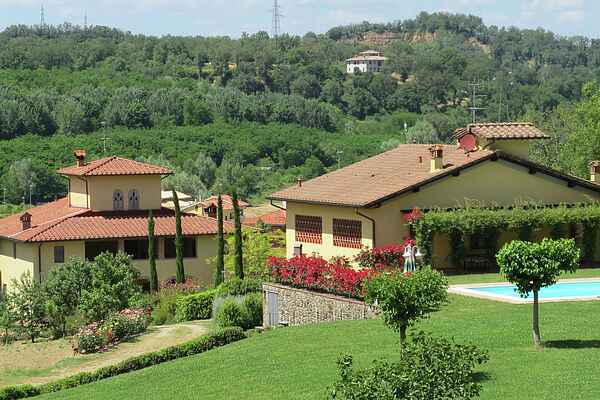 Characteristics of this Chianti region are its numerous vineyards and amazing wineries. You simply cannot fail to experience a tasting at one or several wineries. Each village of the region has its own Chianti Classico. For groceries you can go to the village of San Giovanni Valdarno, 4 kilometres away. Brolio Castle, near Gaiole in Chianti, is highly recommended and about 20 kilometres away. Since the 12th century, this castle has been owned by the noble Ricasoli family, who make their wine in the surrounding hills. You must also make sure to visit the picturesque village of Radda in Chianti, 20 kilometres away. The medieval centre is largely intact and well worth discovering.